Gather ’round for a Christmas story: One Christmas Eve, a few gingerbread dudes and dudettes got all spruced up and gathered together to trim the tree. They took “elfies” and posted the pics on Insta under #xmas squad. All were having a jolly time when one gingerbread dude shouted “it’s midnight!” and a gingerbread dudette squealed “OMG! SANTA!” They all jumped into their little gingerbread car and hauled ginger back home to their beds. Let’s start with the gingerbread cookie dough. Spice and everything nice gets loaded in all up in here. Dripping molasses will make you swoon over the Kitchen Aid when this bit of Christmas comes to life. The recipe for this gingerbread cookie is actually pretty easy, when followed step-by-step. The ginger, all-spice, and cinnamon come together beautifully, then get infused with a good-quality molasses (I used Brer Rabbit). 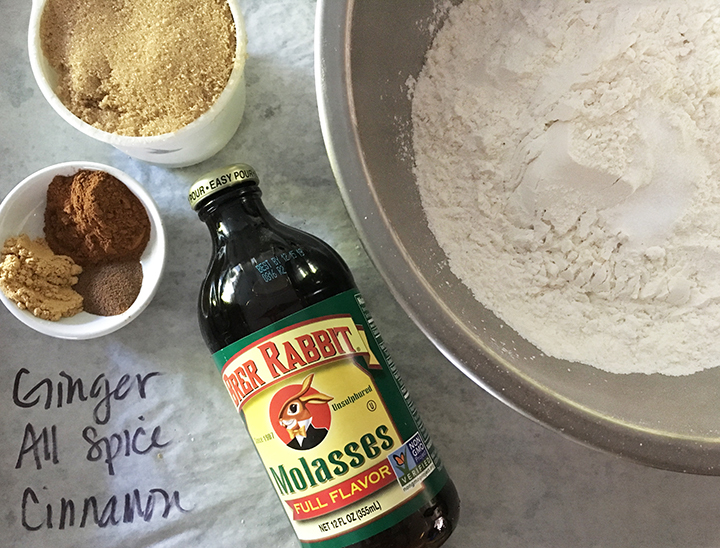 Molasses is made when cane or beet sugar is processed together – it’s the thing that actually gives your cookie that unmistakable ‘ginger-brown’ hue. Together, the flavors create a fantastic color with an even more phenomenal taste. 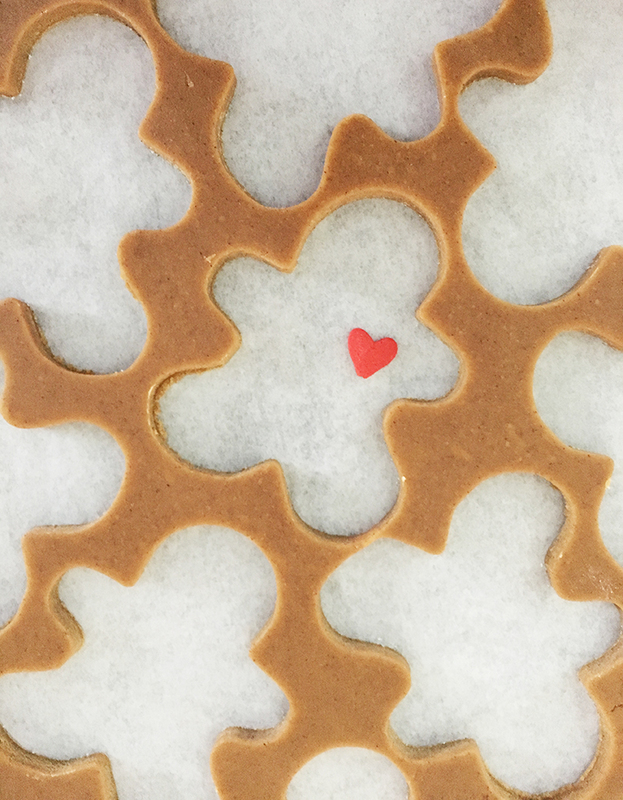 Once your gingerbread cookie dough comes together, pop it in the refrigerator to chill before you roll it out. It will act like most doughs – dust it with flour, and try to keep it chilled. I often roll it into an oval shape, then I pop it back into the refrigerator to chill for maybe another 10 minutes. It’s that exact process that makes the dough pop out of each mold just perfectly. If the dough gets difficult to work with because it’s too warm, back into the fridge it goes for a solid 10 minutes. Also, an easy trick is to roll it out in-between plastic wrap. Place the entire disk in-between plastic wrap, start a-rollin’. Edible Markers. I used Wilton Food Writers. Sprinkles. My fave is Fancy Sprinkles. To really get some smiles, use a saying that is personal to your family and Christmas-ize it. My nieces and nephews will eat up the “Elfie” expression and “#Xmas Squad”. OK, so the car? 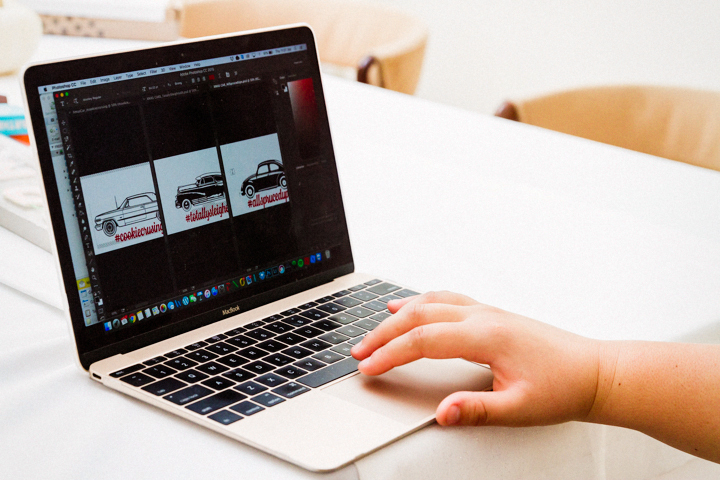 Well – my family does live in LA, and we spend an inordinate amount of time in the automobile! Pick your favorite color food writers and go for it! 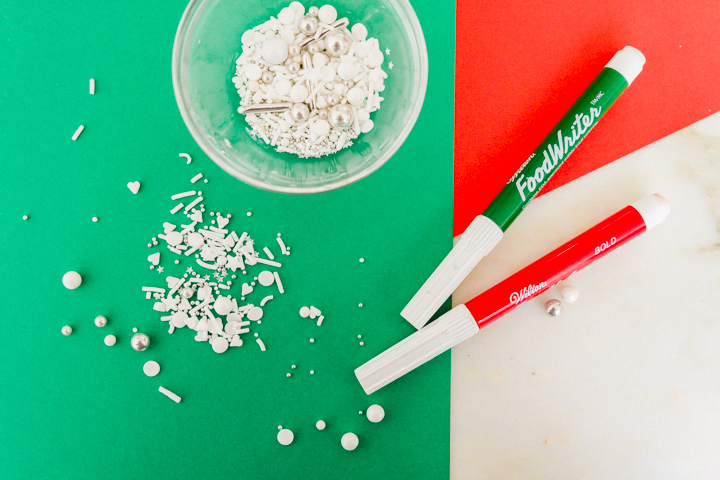 Don’t forget to add your sprinkles! I wanted to add gift bags for the dudes and dudettes, and so to keep with my “All Spruced Up” theme I asked my buddy (and artist) Juan Barajas to help me create some designs. 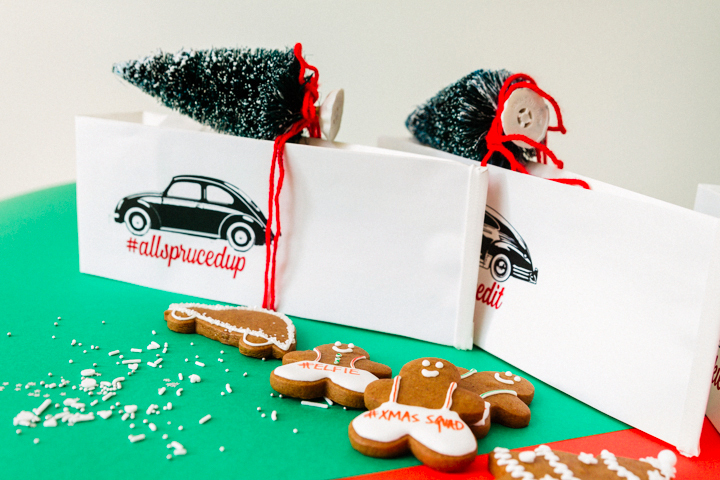 We came up with throwback cars and a hashtag, all downloadable to add to DIY gift bags like these from Paper Mart. Briefly, I want to tell you about my serendipitous daily coffee run. Steves and I go to Blue Bottle Coffee every morning and indulge before the day gets going. 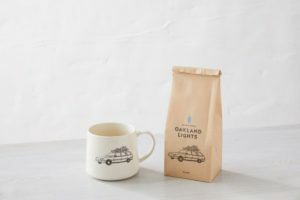 I found the very coolest coffee bag ever that fits our theme of cars topped with a Christmas tree. The coffee is called Oakland Lights, and the name alone brings me back to my previous life living in edgy Oak-town. Great minds think alike, Nor Cal! Then I cleaned house at Joann’s and went a little crazy buying those adorable trees. They look sooo cute tied to the cookie gift bags. Seriously? 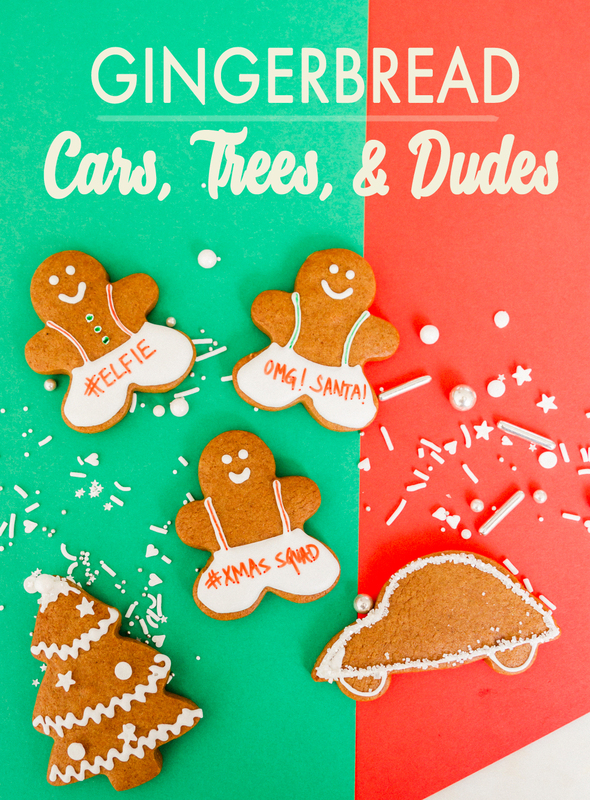 I am in love with these gingerbread dudes cruising right into the hearts of my dearest friends and family. 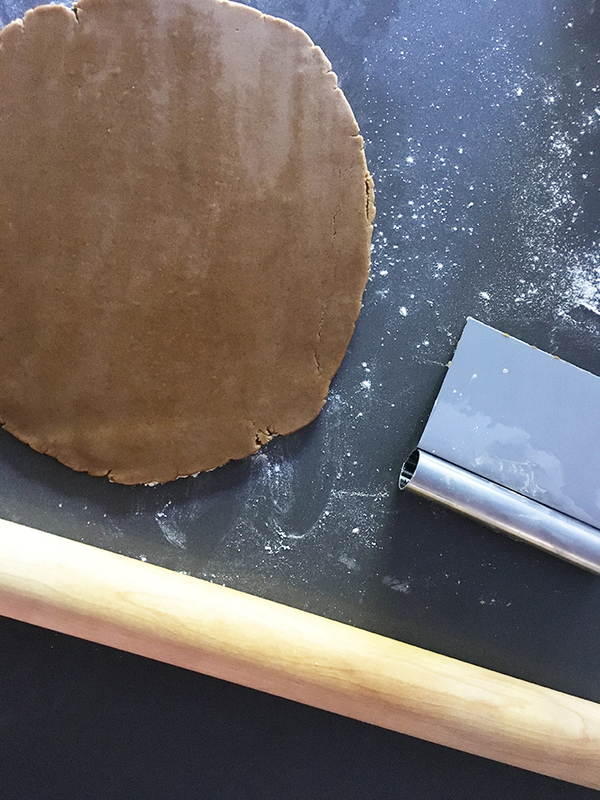 3Bake 2 sheets at a time, rotating halfway through until cookies are firm to the touch, 12 to 15 minutes. Let cool on sheets 5 minutes, then transfer cookies to wire racks to cool completely. 1Using a piping bag, decorate each cookie with royal icing. Add Fancy sprinkles where desired. 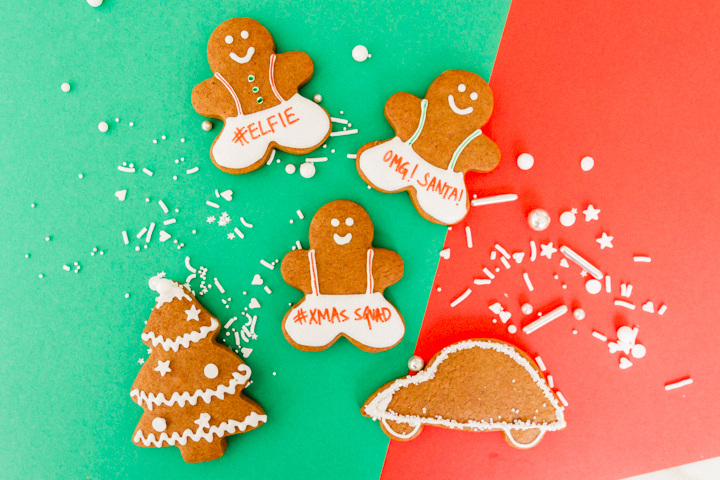 On the gingerbread mens' outfits, use edible markers to write any cute slogans you'd like. These dudes and dudettes are definitely invited to my Christmas party!! Too too fun, my friend! Happy holidays! Loving all of these, especially the dudes 🙂 So fun, festive and delicious! 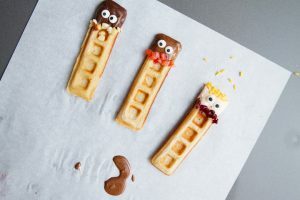 They are tasty and fun with a sprinkle of silly! Looking forward to 2018 Jenn and enjoying your fabulous recipes. we’re gingerbread buddies today my friend. 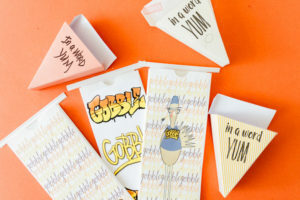 these are delectable and adorable per usual from you! love the fun decorations! Thanks Dawn. I love eating and laughing! You made my day! So totally adorable Cindy! Nothing better than gingerbread at Christmas. These are so fun for the kids! Right? Actually, I could think of a particular jalapeno cheese ball recipe that might top this, but shoot I can’t take that to my exchange. I swear that recipe shows up on my table all the time now. Thanks for the love. Congrats on a wonderful year of spectacular recipes. Love, love, love! 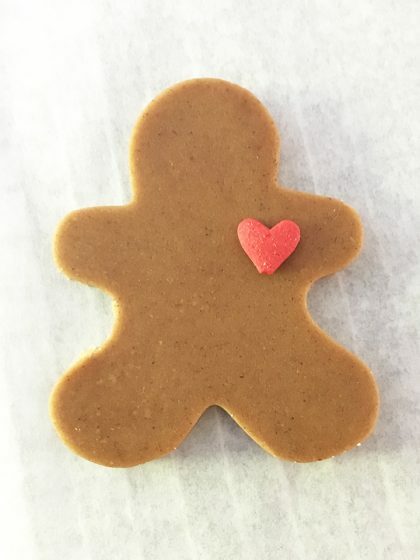 I have always enjoyed gingerbread boys and girls, but these dudes and dudettes are too cute! And edible markers? I never knew… You are so fun and creative! Merry Christmas Cindy! These dudes and dudettes look like they’d be the life of the party, I love them! And I would love to have them with a cup of Blue Bottle Coffee, they’re my favorite! SO cute! I love that you can write on them! Love the gingerbread men! Love the packaging too! 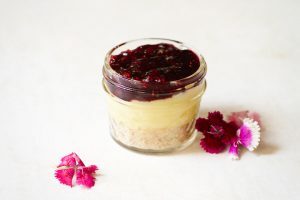 I’m going to give this recipe a try and can’t wait to share it with friends as well! PS thanks for the video which is so helpful for non-artisan’s like me! I absolutely love the sayings you put on them. My sister and I are already planning on making vegan gingerbread and now I can even decorate them with these ideas. Thanks Cindy! So cute – I just love this whole package, from the smart little gingerbread people to the car design on the gift bags. Thanks Cindy! Love the decorated bags. Super creative! The cookies are perfectly cut out too, those crisp edges! 🙂 I think these smiling cookies will make anyone smile for the holidays. 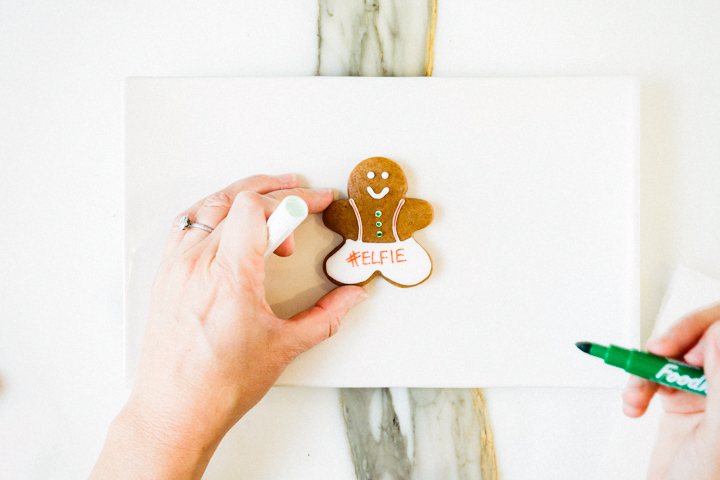 Any cookie that takes “elfies” is a cookie I’m gonna make. And perhaps hang out with. Elfies! Ha, ha! I have all boys in this house and their favorite cookie is a true ginger cookie filled with wonderful molasses and spices. Love that I get ten cookie recipes-bonus! Thank you so much. These adorable gingerbread “people” are so much fun… I am excited that I can be creative while frosting each one of them! I’m sure they’re delish! 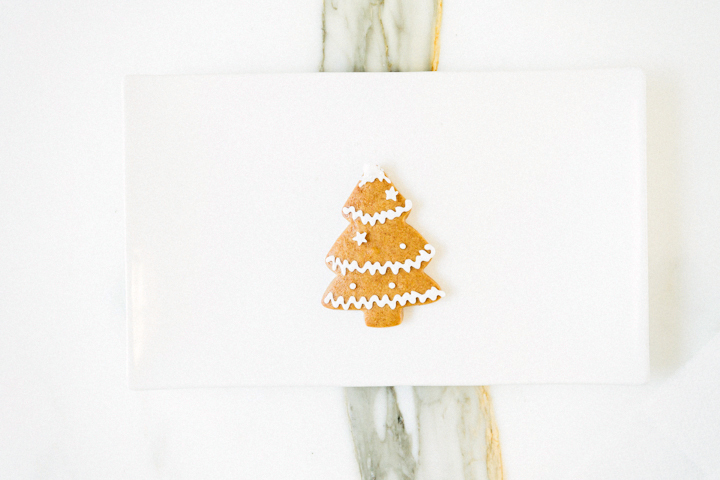 They will definitely be part of my cookie baking this season! Thanks for sharing your talent! Awwww, I don’t think I’ve ever seen a gingerbread person dressed in suspenders before. That’s so freaking adorable, I love it. I also love this recipe! Ginger anything cookie is my favorite type of cookie next to chocolate. Because chocolate. Seriously though, amazing job on these cookies!!! I love gingerbread! 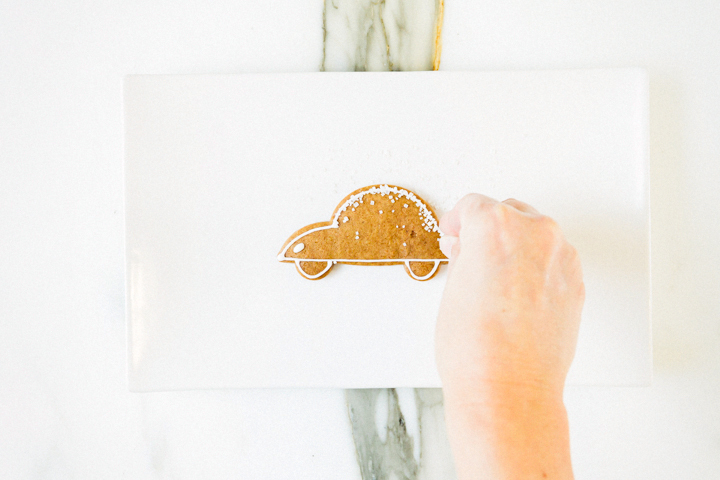 These cookies are classic and super cute! These are so adorable. And I agree – Blue Bottle has the best coffee! !